The original Plumbers Mate. The completely independent and family run plumbing and heating merchant based in Eastbourne in East Sussex. Family run from the start in 1979, with 3 generations working together and the founder still managing the company. Quality and service are words thrown around quite freely nowadays but our old fashioned approach to customer service means that we are honest, helpful and will always do our best to find a solution no matter the size of the problem. In the past 40 years we've grown from a little corner shop supplying copper tube and pipe fittings to becoming one of the largest independent merchants in East Sussex offering everything from washers to complete bathrooms. 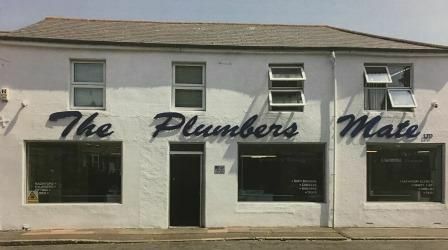 Catering to both the public and the trade, offering all the usual plumbing and heating parts as well as the rare, specialised and hard to find. We also pride ourselves in being able to overcome difficult and awkward installations. As of 2016 we are the official UK spares reseller for McAlpine & Co. There is a saying in Eastbourne: if you can't find it at Plumbers Mate you won't find it anywhere! For product updates and other information from the Plumbers Mate follow us on twitter.